ST. GEORGE – When Mike Rennert walked into the local comics and cards store to buy a pack of baseball cards, he never imagined a special prize would be waiting for him. Rennert has been collecting sports cards for years. He said he had tried to quit at times, but the desire for the cards always got the better of him. That particular day he visited Comics Plus in St. George so his appetite for baseball cards would be sated. After the usual look through the display cases, Rennert settled on a pack of cards from Topps. He opened the package to see which players he had gained, and was greeted with a card he was not expecting to see. As a part of its 60-year diamond anniversary, the Topps Company issued a special series of cards to mark the occasion. Included in its 2011 Series 2 collection is a group of limited-edition reprints. These reprinted cards are autographed by the players they feature, as well as include a piece of game memorabilia form that player – namely a piece of a uniform worn during a game. Both the card and the piece of uniform are kept in a clear plastic casing. Such cards are not always packed into boxes sent to retailer shelves. Instead, a special redemption card in placed in a deck and alerts the buyer to what he or she has won. All that is required after that is for the buyer to contact Topps so the newfound-prizes can be mailed off. 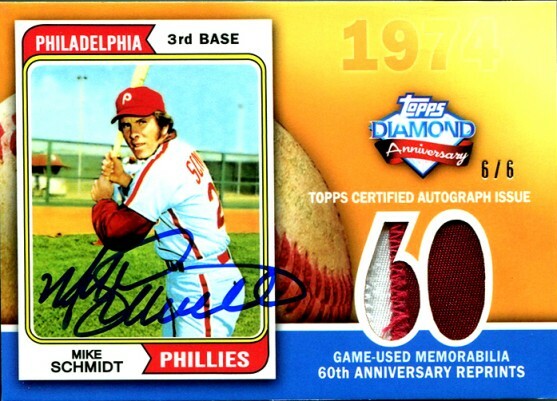 Rennert drew one such redemption card for a limited edition reprint of a 1974 Mike Schmidt card that was autographed by the player and included a piece of the player’s uniform. Mike Schmidt was a third and first baseman for the Philadelphia Phillies from 1974 to 1989. He was inducted into the Baseball Hall of Fame in 1995. 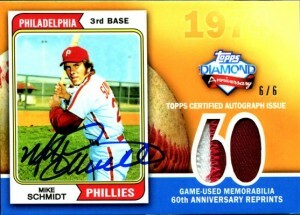 The Topps Company was contacted and Rennert received his new Schmidt card soon after. Once the card arrived, Rennert got another surprise – only six Schmidt reprints had been produced, and he had received the sixth and final one. Rennert said he played baseball a lot as a boy, and followed professional baseball. He definitely recalled Schmidt and other players as his childhood heroes. He said he also got a kick out of the fact he drew card no. 6 on the 60-year anniversary of the Topps Company. David Roland, a friend of Rennert’s and owner of Comics Plus, was happy for his friend. Roland was also grateful that of all his customers, Rennert was the one who drew the redemption card. He explained his friend had not been dealt the best of luck recently, and seeing him get the Schmidt card was a special treat. “If anyone deserves a good card pull, it’s Mike,” he said. Though the card’s overall value is not currently known, Roland estimated it could be worth between $300 and $500.